Have you heard about the refrigerator that sends you a text message telling you to buy milk on your way home? Welcome to the Internet of Things (IoT). Wikipedia defines The Internet of Things as “the network of physical objects—devices, vehicles, buildings and other items—embedded with electronics, software, sensors and network connectivity that enables these objects to collect and exchange data.” In other words, your state-of-the-art devices and appliances can share the information that their embedded sensors accumulate. In the example above, your fridge’s sensors, which are connected to your home wireless network, will recognize that the milk shelf is nearly depleted and share that information with you via your mobile phone or e-mail service. IoT is becoming a component of infrastructure maintenance in several municipalities across the country. Many are fitting their main and auxiliary water lines and sewer systems with sensors that identify structural weaknesses and other problems and target repairs before significant damage occurs. IoT is ultimately going to save utilities a lot effort and money. But how does the IoT relate to your home’s plumbing? That smart refrigerator can also detect potential problems with the water lines that feed your ice maker, and alert you to interruptions in your power supply. Your smart toilet will let you know if there’s a leak, or a foreign object in the exit pipe, or that its inner workings should be tweaked for greater efficiency. Your dishwasher and your disposal unit will be able to tell you that a malfunction is imminent. Your new water heater will be equipped with sensors that monitor water pressure, temperature and the general condition of the heating elements and glass liner, and the networking gear that allows it to share that information with other devices, including your phone. Clearly, your IoT devices and appliances will substantially reduce your vulnerability to potential flooding or other plumbing disasters. Your plumber will even be able to access each appliance’s service and repair history. The IoT is also the future of new construction and remodeling. New smart homes will routinely include sensors along plumbing lines, including those connecting to the public utilities. You will be informed when your sewer lines experience buildup or tree roots and you’ll have time to address the problem before it becomes an expensive repair. If your plumber repairs water pipes in your existing home, he will be able to use sensor-equipped materials that alert you when vulnerable pipes are near the freezing point or damaged for some other reason. IoT will obviously provide meaningful protection against household breakdowns and inconveniences, but is there a downside? The biggest concern is around privacy and security as we increasingly open our homes and our networks—our lives, in fact—to interconnected electronic surveillance by external entities. In response, tech companies are actively focusing on cyber security as our connected devices become a bigger part of our day-to-day experience. A second concern is the life-cycle and responsible disposal of these highly sophisticated devices. Mechanical devices can often still be inexpensively repaired but, for now at least, replacement is often the simplest and cheapest option when increasingly complex, software-centric items break down, and that has an environmental impact. 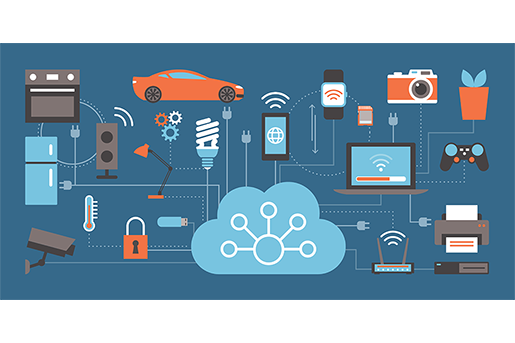 A third concern is the higher initial cost of devices that are fueling the momentum toward IoT technology. As with most other things, however, prices will come down as IoT devices and services become more widely available and used. The Internet of Things is an intriguing and inevitable trend, on track to consist of almost 30 billion objects and achieve a global market value of $7 trillion by 2020. Oversight and improved manufacturing outcomes will diminish most downsides as we move into the next phase of the electronic age. Meanwhile, remember to pick up the milk on the way home!